During years past, there are quite a few file recovery tools entering market. Each has its own features, merits and shortcomings. 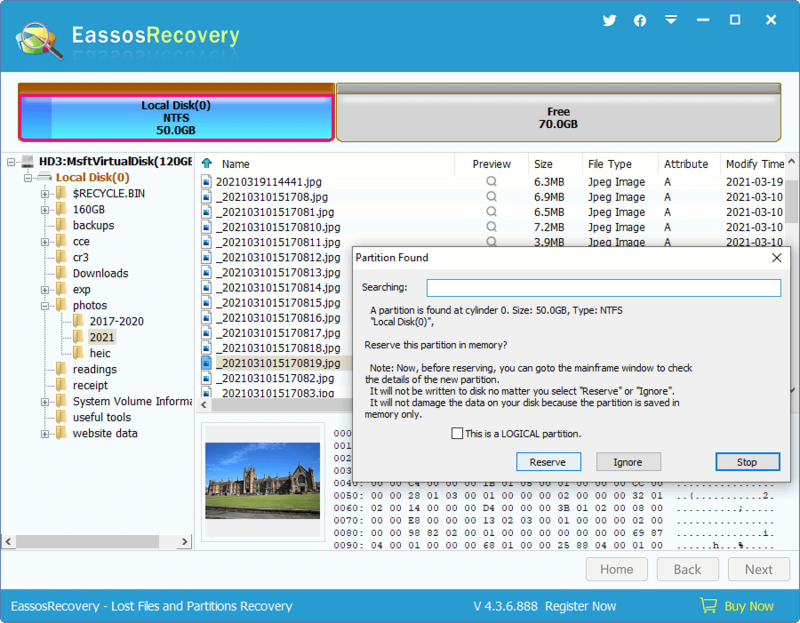 This post is going to review Eassos Recovery, a popular file recovery tool, in all aspect. Have you tried or written reviews about this software before? Do we get same user experience? Let’s find out! Just as the word “Recovery” in its name implies, Eassos Recovery is designed to restore lost data such as undelete files and folders which have been emptied from Recycle Bin or deleted by accident and missing files that are formatted or lost due to partition corruption. 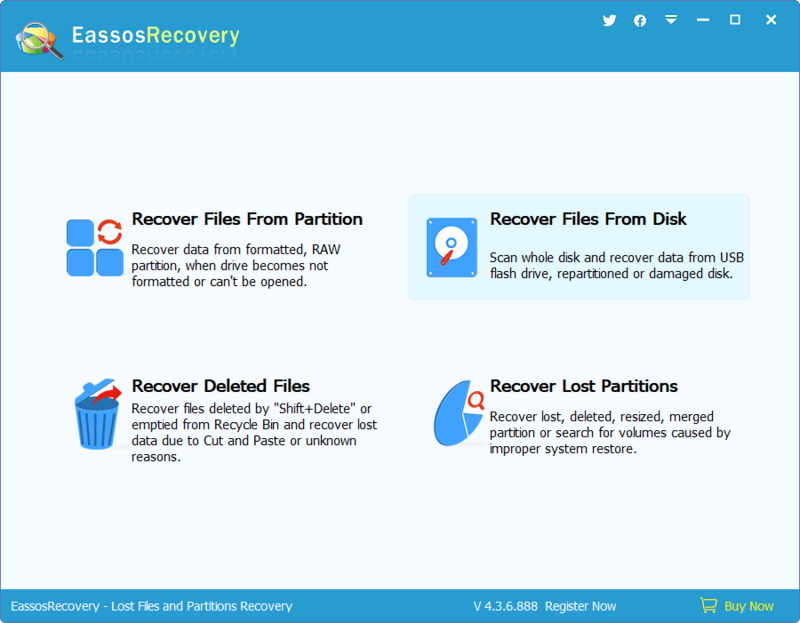 Eassos Recovery has two versions for the moment: Eassos Recovery Free and Eassos Recovery (Full). Search for and recover lost files like files deleted by pressing keys Shifts and Delete and files that are formatted or reformatted from partition. It provides five recovery functions for users, i.e. “Recover Files From Partition”, “Recover Lost Partitions”, “Recover Files From Disk”, “Recover Deleted Files” and “Load Virtual Disk Files”. File preview is allowed and users can preview pictures, documents, text, video and audio files. 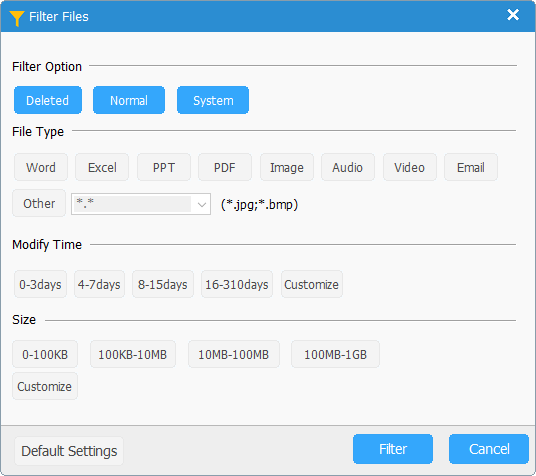 It supports filtering files by file name, type, size and date after file scanning is done. It displays files it just finds out instantly while file scanning is still working. Various storage devices are supported including local disk, USB drive, external hard drive, flash drive, memory card, virtual disk, etc. hard drives that are larger than 2TB are also supported. It can work with all commonly used file systems such as FAT12, FAT16, FAT32, EXFAT, and NTFS. Existing files that are not lost also can be listed in the scanning result and sometimes they are in grey in order to distinguish recovered files. File scanning progress can be saved automatically and manually which means we do not have to scan from beginning if program is restarted. Developer provides free lifetime technical support and upgrade. File preview function is very powerful already, which even supports previewing audio and video files. However, some users want to preview ZIP, RAW, PDF, PST and EXE files. What’s more, Word, Excel and PowerPoint files can be previewed if MS Office is not installed. In some cases, very large picture can’t be previewed and the exactly cutting size is not mentioned by the current version we tested. Eassos Ltd. was established in 2010, and then Eassos Recovery was soon released. It gained popularity quickly due to powerful features and user-friendly interface. This file recovery software dwarfs other recovery tools by way of advanced file scanning technic and continuous improvement and error fix. There is no doubting that no software is perfect, so does Eassos Recovery. It has bugs and shortcoming, but its developer keeps fixing problems, optimizing it and making it more effective. For instance, v3.4 added support if preview audio and video files, which is still not available for other programs at present; compared with v3.8, the v3.9 is able to display simultaneously during file scanning process and allow file scanning to pause and continue. This improvement makes it more convenient to view and restore in shorter period of time. Software developer concerns users’ needs and always tries to meet their requirements, which is impressive. 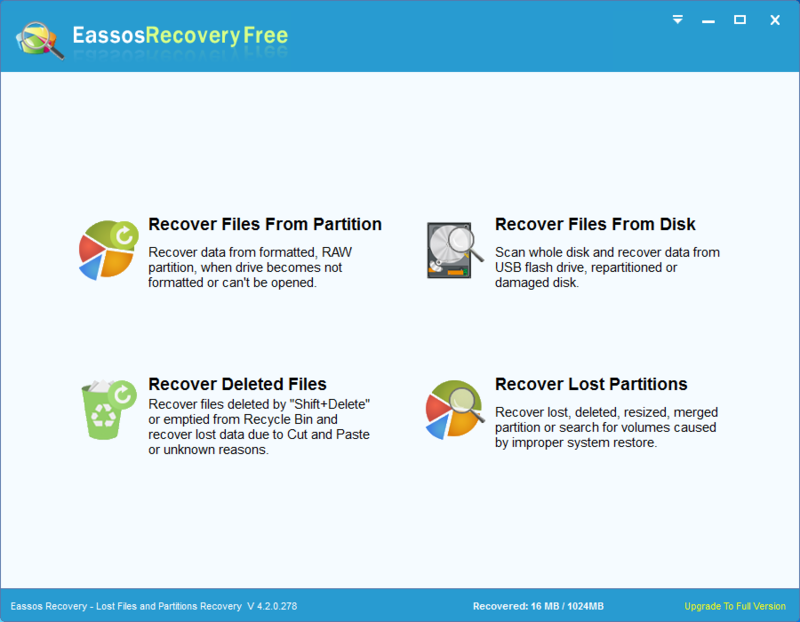 Eassos Recovery is a recovery software that supports file recovery and partition recovery. Partition recovery here not only means recovering lost or deleted partitions but also recovering damaged, corrupted and RAW partition. If you have encountered partition recovery issue you’ll understand the difference. Part 1: How to recover deleted / lost partitions and restore partition table? This recovery mode search the entire drive (local drive, portable drive, SD card, USB flash drive, etc.) you select instead of a certain partition. When it finishes scanning, all partitions will be displayed. User is able to check and preview files of each partition. You should note that partitions shown by the program is not actually recovered. You need click “Next” button to save partition table that contains all these partitions you just found out. Once new partition table is saved, you can see these partitions in “My Computer”. Thus, if you close the software without saving partition table, then the recovery process is not yet done. Another important note is that, if system partition in the new partition table is not the same one your computer is running, then system won’t boot from old system partition. What’s more, Eassos Recovery enable users to copy and save files of all partitions it finds out without saving partition table. When it starts to search for lost partitions, you might be surprised that Eassos Recovery finds out more partitions than you’ve expected. Excited or puzzled? The correct behavior is calming down and take a close look at files of the very partition it displays for you. In fact, you are ask to choose “Reserve” or “Ignore” the partition every time when Eassos Recovery just finds one. How to make the choice between “Reserve” and “Ignore” a partition? File Preview. It’s easy to know whether it is the one you are looking for by previewing files in the partition. Files and folders can be opened by double clicking. Partitions containing useless files can be ignored, and RAW or Unformatted partitions should be ignored too. The deficiency of this recovery mode is that Eassos Recovery doesn’t support searching for lost partitions from specified disk space or cylinder, which is supported in PartitionGuru. Whereas, as to common users current function is useful enough to get back missing partitions. What kind of partition loss problem Eassos can deal with? Here lists several partition loss situations you may meet: hard drive gets repartitioned by accident; computer is restored to factory status; select wrong hard drive when you restore system; partition gets deleted by mistake; entire hard drive is formatted; partition table damages and lose partition information, etc. Recover Lost Partition helps you restore the whole partition together with files and folder in it with original file directory structure. During the test, I recovered the deleted partition quickly and the recovery process is safe and flexible. This function can be regarded as either partition recovery or file recovery based on different principle. I’d like to classify it as partition recovery as it restore files from RAW, corrupted, inaccessible, damaged, unallocated and formatted partitions. For instance, partition can’t be opened and asks to format it. Such kind of partition frequently happens to users and the major reason is that file system gets damaged or corrupted. Damaged or formatted partition doesn’t equal to lost partition, so it can be solved by “Recover Lost Partitions”. “Recover Files From Partition” retrieves files from inaccessible or formatted partition. Usually it displays files and folders of partition with original file directory as well as by file type. Recovering files by type is the result of in-depth scanning, which is very useful in cases that file system is badly damaged or lost files are partly overwritten. It seems that recovering deleted files is the easiest task among all data recovery operations. Deleting files by accident is might be the most common data loss issue, but it is not that easy to get back deleted data. Well, when a file is deleted, its disk space will be marked as Free so that new data can be saved. System writes data follows no principle and it is hard to protect data from being overwritten, especially when we keep using compute or other storage device after deletion. To get better recovery result, Eassos Recovery specially makes the recovery mode an independent function so that file scanning algorithm is specialized. This recovery function works when it is used to Recycle Bin recovery and recover permanently deleted files (e.g. deleted by Shift + Delete). Besides, it is still workable when recovering deleted files from USB flash drive, digital camera, SD card, phone, etc. One thing you need to note is that it is difficult to recover deleted files from SSD, because some SSD adopts trim technic which prevents file recovery for the purpose of reducing SSD read and write times. This is the new challenge for all data recovery software and services. This can be deemed as the overall recovery mode or last resort, as it carries out fully scan of select disk. 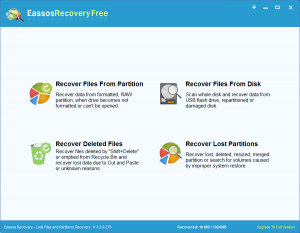 Eassos Recovery supports recovering lost files and partitions when file system or partition table is severely damaged or other recovery mode do not have good result. Besides, it’s able to scan and recover free disk space or certain partition. After selecting the target hard drive, you can select scanning area: any partition on the drive, unallocated or free disk space, entire hard drive or specify range manually. Take note that recovered files can’t be saved to the location where you are recovering files. It sounds like confusing. Let me put it this way. 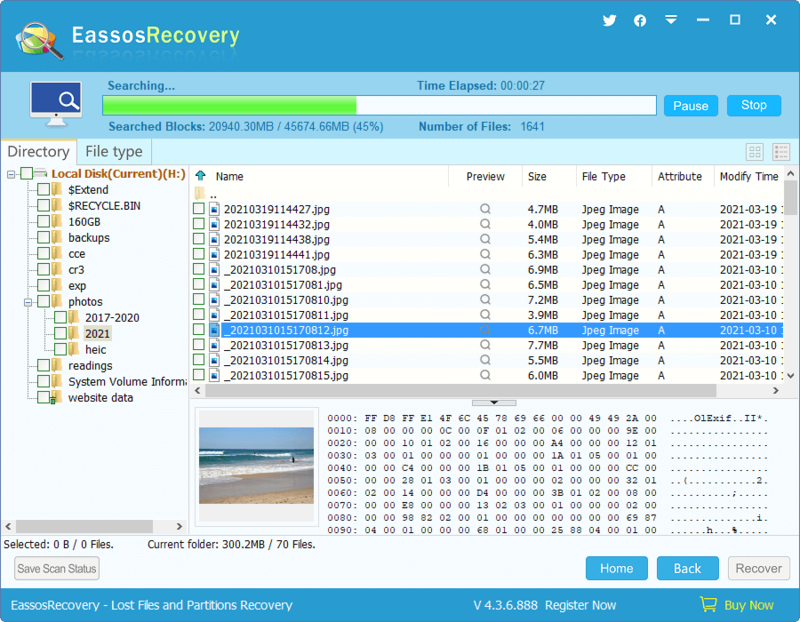 Eassos Recovery displays files and folders it finds out during and after file scanning. This doesn’t mean the end of data recovery. You need to copy and save these files and folders to certain place. You are given the ability to set the target location to store these recovered files, but you can’t set the location which is being recovered. Otherwise Eassos Recovery will ask you choose another path. So it doesn’t allow any writing action to original location or lost data and that’s why we say the recovery process is read-only and safe. Besides, all recovery mode offers the scanning option “Extra Search for Known Types”. In fact, this is the deep scanning recovery. Such recovery style supports nearly 200 file formats. And the developers tells it can add new file type quickly if users need and they can provide two or more files with the file type they need. Eassos Recovery is qualified hard drive and file recovery software with easier recovery steps. The course of recovery is easy and main actions are clicking “Next” button. It is priced reasonably: 30-day license and permanent license. Users can choose the one suits best. Of course, do not forget it has a free version which contains all recovery modes as the full version except “Load Virtual Disk”. The free version is already able to deal with almost all data loss problems we may come across is daily life and working. The full version can be tried for free before actual purchase, so that we can know how the recovery result will be before payment. Eassos Ltd. is great software developer and now it has data recovery software, partition manager, photo recovery software and system restore software. You can visit its website to learn more. This entry was posted in Data Recovery and tagged data recovery software, file recovery software, hard drive recovery, partition recovery, recover deleted files by EASSOS. Bookmark the permalink.